John Hennessy, former president of Stanford University, will moderate a discussion with Bill Meehan and Kim Jonker on Thursday, Nov. 9, at an event hosted on the Stanford campus by the Center on Philanthropy and Civil Society (PACS). The event will start with a reception at 5:00 p.m., and a Q&A session led by Hennessy will take place from 5:30 p.m. to 7:00 p.m. Laura Arrillaga-Andreessen, founder and chair of PACS and author of Giving 2.0, will offer a special introduction to lead off the discussion. 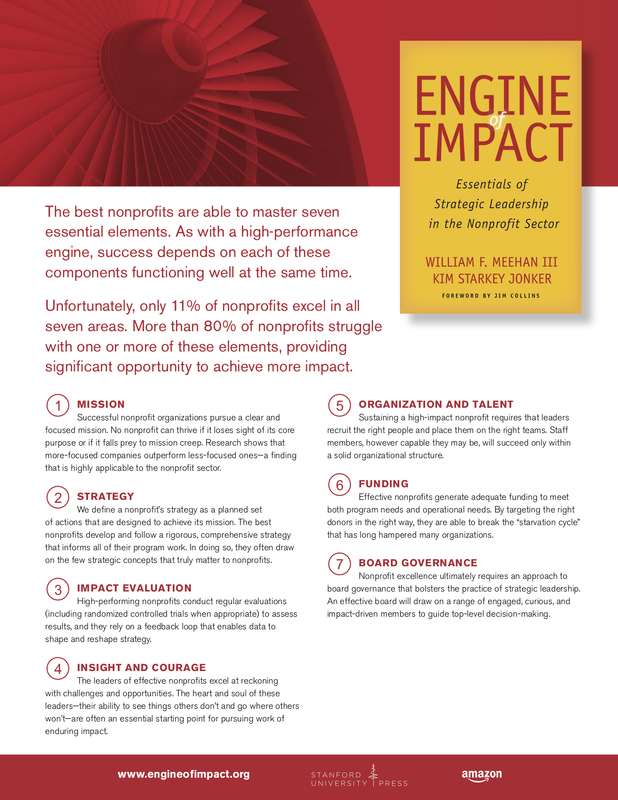 Copies of Engine of Impact will be available for purchase, and Meehan and Jonker will sign books following the Q&A session. The authors of Engine of Impact have close connections to PACS. Meehan is a founding member of the PACS advisory board, and Jonker was a visiting practitioner at the center. If you wish to attend the event, click here to register for it. Registered attendees will receive information on the exact location for the event beforehand.